You have probably seen Himalayan Salt Lamps rising in popularity lately, and wondered why. After all they are fairly unusual looking. But there are some pretty interesting reasons people have been using these in their homes for years. What Does a Himalayan Salt Lamp Do? The reason people use Himalayan Salt Lamps in their homes, is because they have long been used as a natural air purifier. The lamp heats the salt, which then emits negative ions that clean the air inside the home. Many people suggest that using these salt lamps helps boost blood flow, and fight asthma and allergy symptoms. Others say the naturally ionized air also helps you sleep better at night, improving your mood. Some people use them simply to improve the smell in a room, especially pet owners! 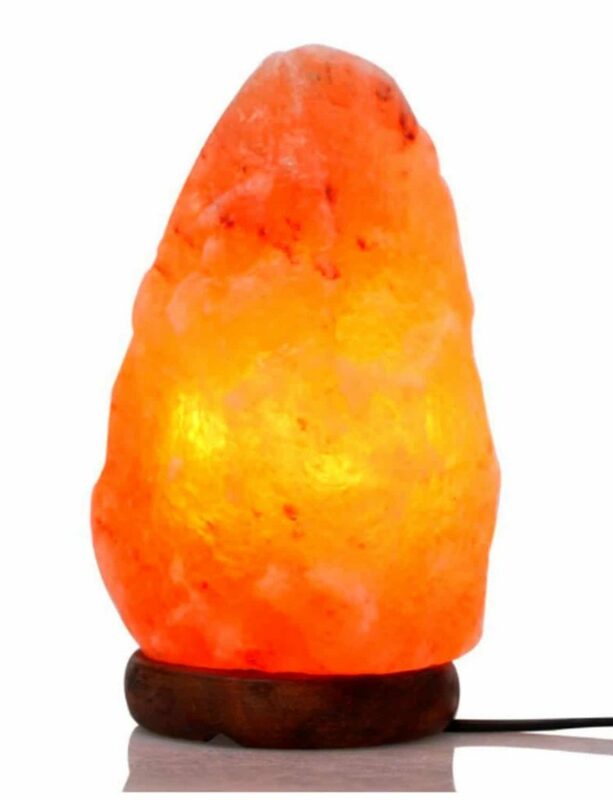 The Himalayan Salt Lamps also emit a nice glow which is perfect for a night light, or soft lamp throughout the home. If you’re considering trying one out in your own home, check out our review to find the best Himalayan Salt Lamp. 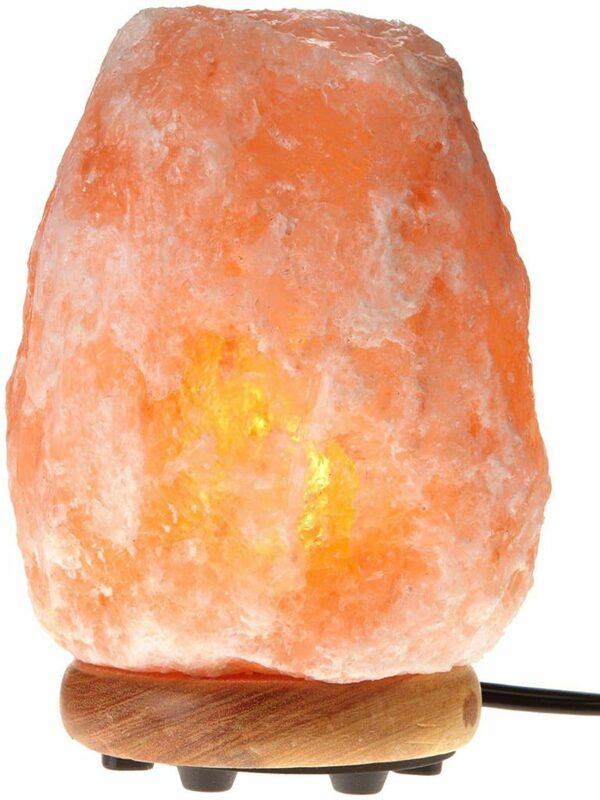 These Himalayan Salt Lamp by Windsor Seasons are hand selected and only use purest himalayan crystal rock salt. The salt crystal itself is carved both internally and externally to produce a unique and beautiful glow. The salt sits on top of a sturdy base made from genuine Neem wood, which has a nice natural scent. This lamp has a bright glow when turned on, but it uses a dimmer control switch which allows you to adjust the lighting whenever you need. It works hard to reduce negative ions, eliminating harmful odors in the air. This lamp is very easy to set up and install, and emits a pretty orange glow when lit. 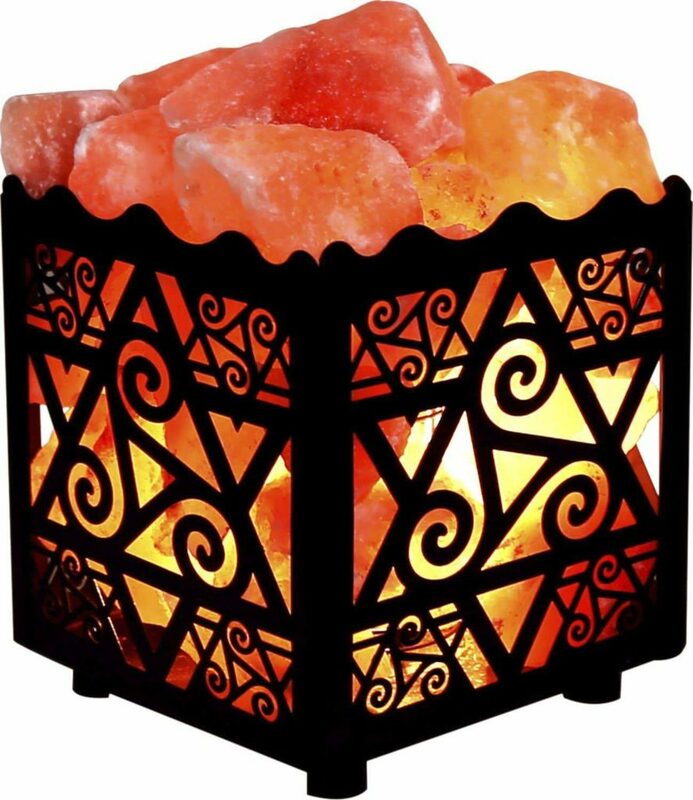 Crystal Decor makes Himalayan Salt Lamps, which you can get in sizes ranging from 6-13 inches. The lamp itself is more pink when lit than some other similar lamps, and each one is hard carved. This lamp emits a pink glow when lit unlike other lamps which appear a bit more orange. It works well to reduce natural allergens in the home, and is also an excellent source of light. While each lamp is a little different in shape, they all sit atop a pretty natural wood base. 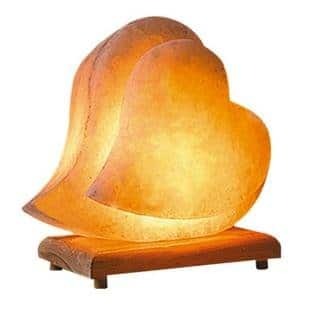 This heart shaped Himalayan Salt Lamp is a beautiful spin on a unique concept. It features the double heart shape, over top of a beautiful Neem wood base with rounded edges. This style of lamp would be a great romantic gift for a loved one, and really brings a Feng Shui quality to space. The lamp has a dimmer feature to adjust the brightness, and will provide soothing light and air purity to any room in your home. 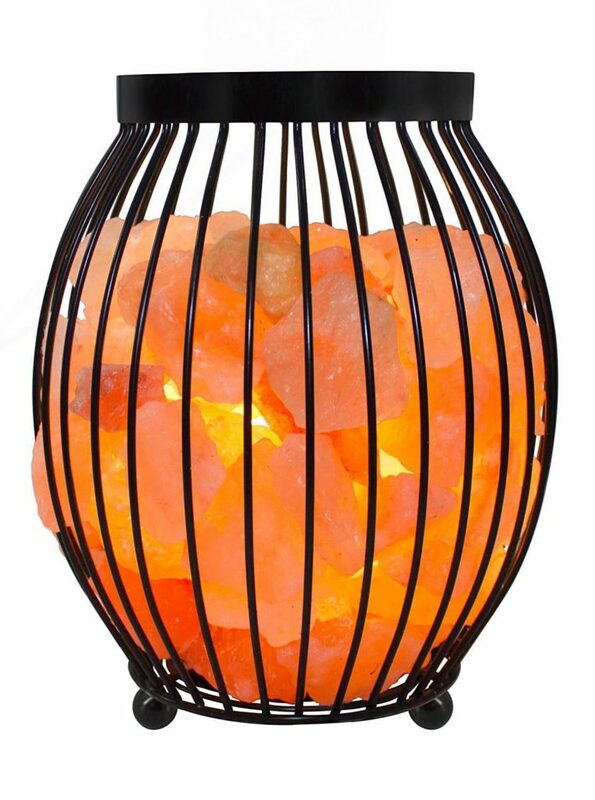 This salt lamp is another unique version, featuring salt chunks in a classic oval style metal basket. This basket makes the Himalayan Salt Lamp fit more naturally with modern decor, and it looks great in any room. The salt itself is mined in the Himalayan mountains, and purifies the air all around when lit. This basket shaped lamp also features a rotary dimmer switch so that you can adjust the brightness throughout the day. It measures about 6 inches at the widest point, and will last for a long time with daily use. This brand also comes in a variety of other designs, that will suit anyones decor tastes. The WBM brand is one of the most popular choices for Himalayan Salt Lamps because they come in a variety of sizes, and are some of the most inexpensive on the market. They come in sizes ranging from 4-12 inches, and each one is hand carved. The salt sits atop a Neem wood base, and emits a calming amber colored light when turned on. These lamps work wonders for purifying surrounding air, and it also features a dimmer bulb control to easily adjust light. Due to their popularity, they are often behind on stock so consider purchasing multiples at a time if you can’t stand longer shipping times! 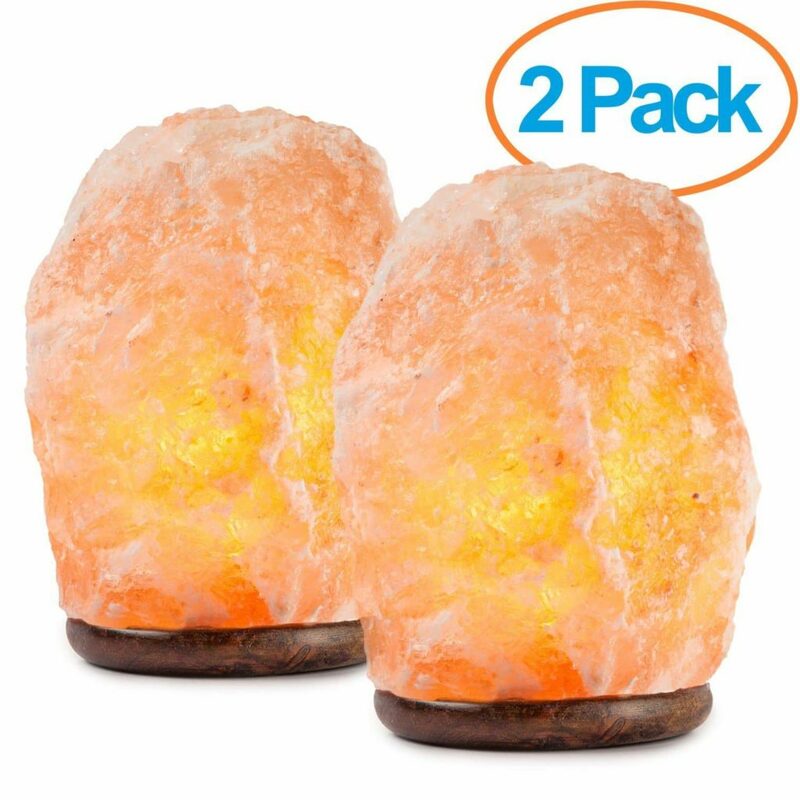 This set of two Hand carved natural crystal Himalayan Salt Lamps is the perfect purchase for frequent users. These twin lamps sit on top of a wooden base, which is a little thiner than some of the other brands, but is still very sturdy. Each lamp is hand carved, and is capable of releasing negative ions to purify the air. This set is a great value for the price, and comes complete with a dimmer switch to easily control the brightness. This Himalayan Salt Lamp basket from crystal decor is fun and interesting. This version comes in a variety of designs, such as Flower, Star, Sun, Angel, Cross, Jesus, and more. The unit itself is 5″ x 5″ x 5″ in size, and can fit perfectly on any desk or table top. This unit works great to purify the air, clearing it from natural allergens such as smoke, pet dander, and pollens. The chic design of this salt lamp also makes it a great fit to be used as a bathroom light, bedroom light, hallway light or anywhere else want to bring a soft glow! Any one of these Himalayan Salt Lamps would be a great choice for using in the home. The most important thing is that whichever one you choose fits with your decor choices, so that you enjoy looking at it everyday! We hope you enjoyed checking out the best Himalayan Salt Lamps out there, and hope you have fun trying them out! Happy Lamping!